I started with the Essence XXL nail protector as base coat. 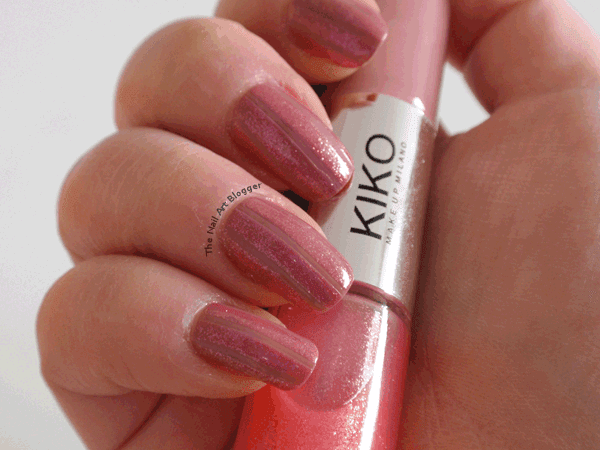 And topped it with the full color side of Kiko’s Multi Effect Nai Lacquer #02 Roswood & Fuchsia. Then placed three striping tapes on the nails, and painted them with the glossy color of the same polish from Kiko. I liked the result. And me being me, I decided to try the matte top coat, and here’s how it looks like. I love mattified shimmer polishes. They get this velvety feel to them and I end up staring at my nails the whole time. Pretty distracting when you’re trying to study. But this particular one I would wear with a glossy top coat as well, and it would definitely be just as distracting.